Available in POS Version 2011.2.0.91 or above. Default for Transferring Unpaid Invoices to Debtors Module – added functionality to set the default option as per the last time it was run. 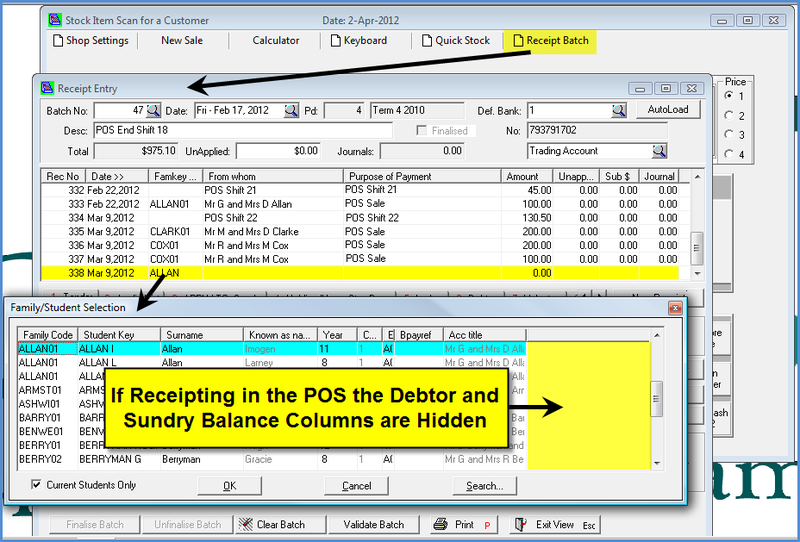 If ‘Sundry’ was selected it is saving this in the field PosShop.Letter as “S” and when the Transfer to Debtors is next run it will set this default field in the Shop record. This will mean that it is possibly to consolidate different shops to different defaults (Sundry or Debtors). This entry was posted in Point of Sale, Updates and tagged Classroom Management, Point of Sale, Receipt Entry, school administration software, School Administration System, School Management Software, School Management System, school software, Student Information System, student management Software, Student Management System by studentmanagementsoftware. Bookmark the permalink.